The Chair, Birgitta Sacrédeus welcomed participants to the first meeting of the year. She informed attendees about the logistical arrangements. The agenda of the meeting was adopted as proposed. The meeting was an opportunity to hear from CoR Member and Chair of IRGHW, Birgitta Sacrédeus, who presented the CoR own-initiative opinion, for which she is the rapporteur, “Integration, Cooperation and Performance of Health Systems”. The intervention was followed by a presentation by Mr Jorge Pinto Antunes, Performance of National Health Systems, DG SANTE, on European Commission current and foreseen activities within the issue areas of the opinion. Mr Jorge Pinto Antunes explained that the EC proposed an EU agenda for effective, accessible and resilient health systems in 2014. He further explained that the European Semester consistently takes note of the Commission’s agenda in terms of health, including health recommendations per Member State. Mr Pinto drew our attention to the slight growth of the number of country specific recommendations in the field of health stressing that their breadth and scope have also improved. The EU Expert group on Health Systems Performance Assessment (28 EU MS + Norway, OECD, WHO and European Observatory) creates a forum for exchange on the use of HSPA, define criteria and procedures. Normally, the Expert Group works on 2 topics a year and have recently completed a cycle on integrated care. The work on this topic is also carried out in the EIP-AHA Action Group B3 on Integrated Care where they identify benchmarks and develop assessment tools themselves. Mr Pinto acknowledged the importance of local authorities and stressed that they should be part of the dialogue. Regarding access to innovative medicines, the EC has limited competence, yet strives to improve cooperation and coordination at the EU level. One of the examples is STAMP: Expert Group on Safe and Timely Access to Medicines for Patients; Euripid project. The Commission also has an established Expert Panel on Investing in Health, which provides a non-binding advice on effective ways on investing in health. Currently panel is working on three opinions: 1. Innovative payment models for high-cost innovative medicines, 2. Benchmarking access to healthcare in the EU, 3. Tools and methodologies for assessing the performance of primary care. The Chair thanked the Committee of the Regions for hosting the meeting and the speakers, as well as the participants. She closed the meeting by wishing for the continuation of our work together in the future. 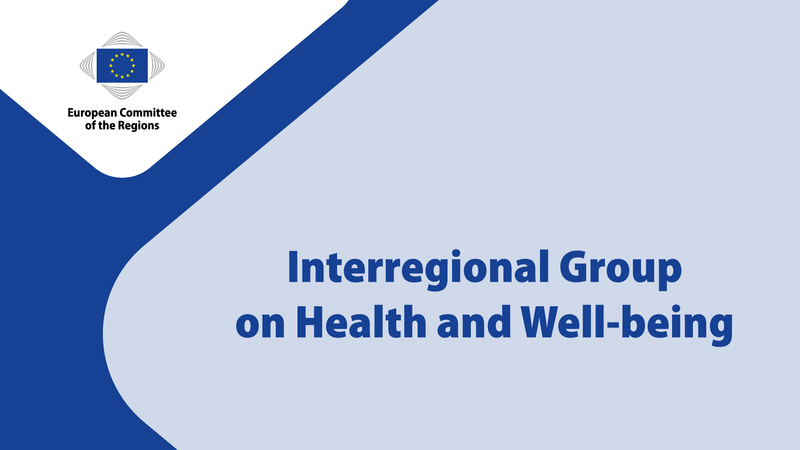 The next meeting of the CoR Interregional Group on Health and Wellbeing will take place on 12 May on the topic “Integrated care”. Further information about this meeting will be circulated soon.